This adapter ring allows you to use the Canon FD lens on the Canon EOS M (EF-M mount) camera body. Not for Canon EOS film/digital SLR cameras(EF mount). 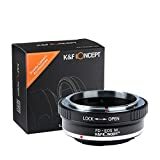 • The K&F Concept FD Mount Lens to EOS M Camera lens mount adapter allows you to place your favorite FD lens on your Canon EOS M mount camera body. • This adapter ring is designed for Canon EOS-M Mirrorless Camera M1 M2 M3 Only. This entry was posted in Discount Photography and tagged Adapter, Camera, Canon, Concept, lens, Mount by Ball Photo. Bookmark the permalink.